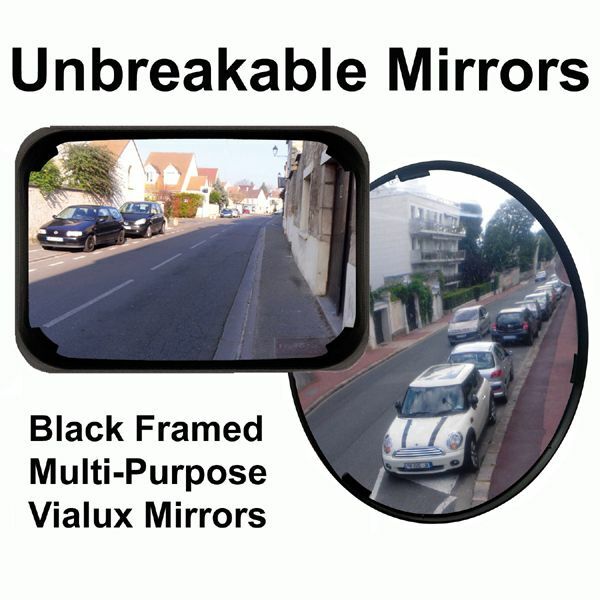 This robust range of unbreakable black framed mirrors can be used indoors or outdoors. Their distinctive black frames make these unbreakable mirrors ideal for use in a wide range of environments and locations, and just like the little black dress, a black framed mirror blends nicely with almost anything, so it should be able to help improve visibility almost anywhere. With a choice of round or rectangular mirrors and a range of different sizes, there`s bound to be one that`s just right for your application, and each mirror comes as standard with a heavy duty all weather fixing kit designed for easy installation onto an existing post or wall (or other flat surface). We also offer this range of mirrors with alternative frame colours; High Visibility Red Framed Mirrors which are popular for a wide range of uses including civil Works, green framed ECO mirrors which blend naturally with hedgerows or other foliage, and of course we also offer the ever popular Multi Purpose White Framed Mirrors. Pay a visit to our Mirror Information Page for more comprehensive information and advice.